March 22, 2011 was a birthday I’ll never forget. After an early morning cut and color with the Russian in tow, we turned the last corner before arriving “home” and from a block away I could see a huge box sitting on front porch of Melanie’s house. 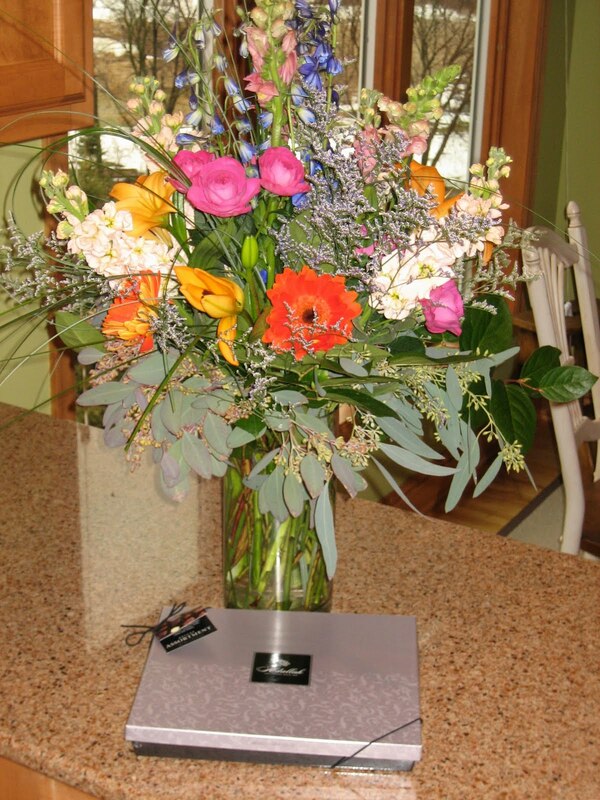 Upon closer inspection of the giant box, I was happy to discover the largest flower arrangement I’ve ever received, accompanied by a big box of chocolates with a card indicating that my darling husband wished me a Happy Birthday and hoped that we would be together soon. After getting the gi-normous bouquet into the house, I checked the mailbox to find a Social Security card for Dennis. Since he and I had made multiple visits to the regional Social Security Process Center in downtown Minneapolis (please interpret that to not much fun, especially with a three year old) to obtain said document, I was very happy to FINALLY have the darned card. I was thinking that the card was a GREAT birthday present to receive, right up to the time I checked my email and found a VERY special email, which we had been waiting on from the Australian Embassy in Washington DC. You guessed it - the Aussies trumped the Social Security administration, by notifying me that Dennis’ visa had been granted and he could finally enter Australia! Now that - was the BEST birthday present EVER!!!!!! The next 10 days passed in a hectic blur and we headed to the airport on April 1 for the last four flights of my around the world tour. The night before we left, our fairy god mother, Melanie, took us out to dinner at Red Robin for a all American big gooey hamburger and chocolate malt, but not before we visited “Build a Bear”. I have to admit that I’d never been to the bear building business and was only vaguely aware of what it was. Dennis got to select a critter to build and then participate in the stuffing, brushing, bathing and dressing of the critter. This process is how “Jammie Time” the monkey came into our lives. Melanie and Dennis in "bathing" the new arrival. Dennis with Fairy God Mother, Melanie. During the preceding two months of our stay in Minnesota, Dennis and I had encountered a few challenges during the bed time process (he didn’t want to go to bed and Mom was about ready to pull her hair out). To combat these challenges, I had changed the end of day ritual into a celebration called “Jammie Time” with singing and dancing. When the time came in the Build a Bear process to choose clothes for the newly made critter, we discovered that most of the offerings were rather girlish and not quite appropriate for a monkey. As soon as we held up the PJs complete with a whole for the tail, Dennis shouted “Jammie Time” and the name just stuck. Fortunately, Dennis has turned out to be a champion traveler. He settles in his seat, puts the blanket across his legs, tucks Jammie Time in beside him and snaps the seat belt around both of them. As soon as the seat belt sign goes off, he requests the DVD player for a movie and then sits back to enjoy the movie and wait for the chance to flirt with the flight attendants. He’s a bit shameless about it, but we get excellent service during the flight! We flew from Minneapolis to Dallas then onto San Francisco for a midnight flight to Sydney. It had been a long day for both of us and I was very jealous of him when we popped him into his footed pajamas before boarding the flight. 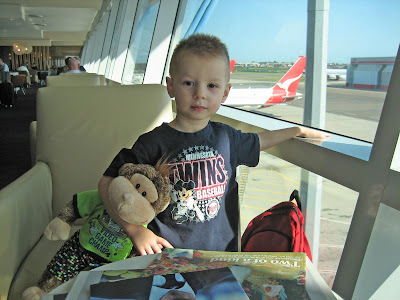 Fourteen hours after takeoff, we landed in Sydney, switched from the international to the domestic terminal, got a shower in the Qantas lounge, had a leisurely breakfast and read the paper before hopping the final flight to Alice Springs. After 107 days and 13 flights, I had circled the globe and returned home a mom. Who would have thunk it!